For almost a year, I haven’t been able to drive or walk past an active construction site without feeling PTSD. I remember my drive across Texas last December, after my time in North Dakota and seeing a simple road crew repairing the highway, and how I had to pull over at the next rest stop because I was shaking so bad. The whole time I was looking for the yellow helicopter and snipers with orange paint on their rifles on the hills. I continued to turn off my cell phone for all low-flying planes. Currently, they’re rebuilding a pipeline in the Rio Grande Gorge on the way to Santa Fe. I do my best not to feel the pain of the Earth every time I pass it. Just last week, in Philly I saw the construction there as what it really is, another war zone. In the cities, they commit war crimes against the most vulnerable. Everywhere else, they do the same, but also dig up Earth, attacking her directly, poisoning everyone downstream. I’ve learned my exits in protests, learned how to stay out of harm’s way, but then there was that one time they blocked a caravan of over 500 warriors from returning back to camp after an action where we arrived and left peacefully and in prayer, to check each car for specific people they designated as leaders and wanted to imprison. I thought they were going to arrest all 500 of us that day. Leave our cars stranded and impound what they could. The walked amongst the cars with rifles drawn, face masks on. For them this was some kind of war game to put on. Before leaving that action, I retraced my steps to make sure my sister that I traveled with made it out okay. The highway was clouds of mace and the approaching army of hundreds of heavily armed police in military fatigues. My phone was blaring the alarm that the highway was shut down due to protester activity and to seek other routes. My brother who I met in Rosebud camp and was just beginning to develop a solar powered recording studio to record and train native youth in DIY recording when I met him is now stuck in a jail cell because a rogue judge wanted to prove a point and send fear into other protectors. He was on a prayer walk. That’s it. That’s why they put him away. Red Fawn who was arrested over a year ago, is still sitting in a jail cell for things she didn’t commit. She has yet to even be sentenced and her lawyers and family have a hard time reaching her. We have living prisoners of war in our country. It’s not just Leonard Peltier who’s been stuck in a jail cell and survived several assassination attempts since the 70s for a crime he didn’t commit. This is a women, not much older than myself, who they’ve imprisoned because they recognized her strength. I was there for election day, but all of this happened in Obama’s America. The acting president of the United States couldn’t even mention the war that was going on in our own country, until most of it had already happened. He was questioned by the UN, by international citizens, and he would dodge the questions. His faux call for a halt to destruction last December was to save face because they didn’t want the bad press of the thousands of veterans who arrived in support and to stand guard over the prayers sustaining the same wounds and trauma that our indigenous relatives had already been going through for months. The pipeline didn’t even stop building for a single day, even though his call for a halt made construction illegal. Even though it was illegal all along because of broken treaties and the lack of an environmental impact statement. Don’t share this post. Look to our indigenous relatives who faced much worse. Have been fighting against genocide for over 500 years. I share my experience, because the trauma is not forgotten by those who were there. By those who were connected to the movement, even though they couldn’t be there in person. It is still faced by those who are fighting for their lives, for their culture in the dozen or so pipeline and other resource extraction projects currently being built across the continent on indigenous land, right now. Over burial mounds and other sacred sites. Through sacred waterways and traditional hunting grounds. Today, is an anniversary for a lot of us. For me, it was the eviction of the Treaty Camp that finally pushed me to let go of everything else and get up there. I should’ve been there earlier. I could’ve been there earlier, but felt I needed a grounded group with a plan to arrive with. I spent most of my time there chopping wood and delivering it to different folks in need. Spent time offering support to the IIYC. I lived the most relaxed life I could’ve dreamed. I actually, for the first time in my life, felt like a human being. I’ve seen myself in those photos. I still can’t believe how utterly honest the Corporate States of America could be. Armored tanks and military fatigues. Sound cannons and humvees equipped with microwaves. Snipers on the hills and no sign of the police to lock up these hired goons. The fact that I was there and it was in my own country still baffles me. At night I would sit by the sacred fire in Rosebud and listen to the elders. Mostly they would crack jokes back and forth or talk about where they were from. They seemed to never sleep because I always left them there still talking no matter how late it was. I remember they talked about the youth a few times. The young warriors who had been maced, tear-gassed, shot with rubber bullets, and physically brutalized during the eviction of the treaty camp and the attempt to reclaim Turtle Island a few days later. The elders commented on how for some of the youth it was as if their spirit had sunk back in them. The light in their eyes was shrinking. They worried about their well-being. The IIYC talked about it too at meetings. While I was there they organized a candlelit vigil to pray for those still experiencing trauma. To pray for those who attacked them. 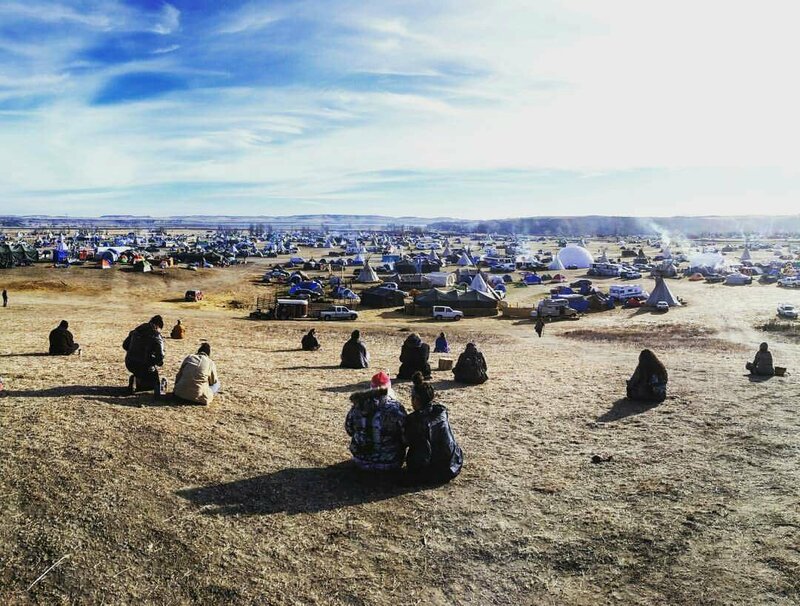 It seemed like a thousand of us walked with them with lit candles to the Cannonball River where only a week before, warriors had held a line singing prayers in the freezing river while the police tear-gassed and maced them. During the candlelit vigil there was not a single word of condemnation for the other side. Even with all that trauma and suffering. The youth leaders only asked for the strength to keep going. For the ancestors to help them heal their spirits. I saw so much power glowing in them from that day forward. Their prayers were answered in so many forms. We live in a capitalist, corporate-owned, police state. We have lived in one since the Constitution was written. Since the Declaration of Independence. Who’s independence? Not mine. Not yours. Not the hundreds of tribes who have faced cultural genocide since Columbus first set foot in the outer reaches of this place. Not the millions of descendants of slaves who despite Amendment 13 haven’t received their freedom because of the color of their skin. Folks want to say because of last year’s election, there is a renewed sense of urgency. No. There has always been an urgency. Now, we just get to see it more clearly. The whole damn thing is broken. It never worked in the first place. We are overdue for something new, or a return to the values of this continent’s First Nations’ peoples. John Trudell speaks wisdom when he says “We Are Power”. It’s not just power to the people, like what everyone was saying in the 60s. The corporations and mercenaries in North Dakota understood that. The Corporate States of America understand that. That is why they attacked us with so much force. Their only understanding of power is brute force. Their fear of this power can and will not break our spirit. Their methods of oppression are weak and inferior. Their time of ruling over us is running out. Together we have the power to overcome all of it and start something post-imperialist. We have the power to free us all and together create a more peaceful world in tune with this planet we live on and all the nations of people who call it their home. Walking through South Kensington is like walking through a war zone. Rapid fire machine guns. Nail guns. Jackhammers. Industrial machinery. Tractor trailers beeping backwards. Dump trucks unfilling their refuse. Shouting so loudly the dust shakes off old concrete bricks and into a cloud of chaos. Eris rules supreme. The sound waves echoing off half-constructed shoddy plywood walls holding up these neo-futuristic monstrosities. Desolate warehouses collapsing under the severe pressure of the drum taps. Ash and smoke rising in the breeze from block to abandoned lot, where the bodies used to pile, now turned into yuppie condos. Out west they are burning down whole forests, old redwood groves. Whole towns. The “carelessness” of the people in charge. A stray electric wire on a utility pole. Wonder what mini-mall they’ll build next in place of these historic sights. Back east we’re building rich American Dreams for those who can’t dream on their own. The Manifest Destiny of filling every neighborhood corner and former urban garden and raw alley and even the cracks in the sidewalk with the travesty of supply and demand for a place where no one will know your name, even though you live right next to them, and there’s high black gates in front of every doorway in case someone gets the wrong impression seeking a neighbor. How did I live through this as long as I did? With every step I step a little closer to this nervousness inside myself coming to the surface. Unconscious to it but feeling my heart racing nonetheless. This concrete jungle active and alive as whole neighborhoods are renovated to suit rich white folk interests from New York and the Jersey burbs squashing an identity that took decades, even generations to grow. Gentrification in a matter of moments. Developers greedy rich with ideas for what they’ll call this “new” hood, sequestering google maps with murals and handmade road signs they hang from telephone poles, depicting a language of money. One thing I forget until I return to Philly is the depression. What it feels like to have your hopes dashed in front of you by machines more powerful. Corruption and greed using the anarchy of bureaucracy against you. Creating new structures out of a world that you thought was shared. The exteriors built to crumble so the replacements aren’t even worth the amount of trauma they subjugate us with. I find it interesting how as I cross over into Northern Liberties, an old hot bed for this type of displacement which has mostly settled down in recent years, except for the outer reaches, my mind and my heart come back into focus. I feel present with my surroundings. I experience the feeling of readjustment. Being one with the sun above. I can actually hear myself think and the sound of my brother speak, telling a story he’s been saying all along but as we crossed into the war zone it became all jumbled, practically frantic, losing its focus, and becoming just more of the static as I try to make out his point but can’t even figure out what is happening in the present moment.